Hard to believe that it is March and St. Patrick's Day will be here soon. I got a lot of nice comments on my first post about making sentences with sentence frames so I decided to do one for St. Patrick's Day and add a little extra. I decided to add Picture/Word cards to make sure that students are familiar with the vocabulary that is related to the holiday such as in the picture below. Students will not only match the pictures and words but also have a chance to write about a few of them. 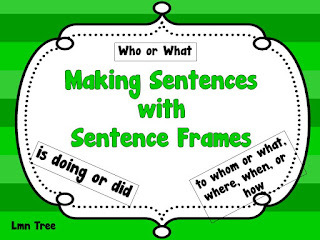 In the teacher directed activity each student will have the 3 sentence frame cards. Explain that every sentence needs to have these 3 parts. On the board or on a sentence strip, if you use a pocket chart, write the following sentence that you see below: The girl is holding a gold coin. Then hold up "is holding" card and ask the students, "Hold up the card that tells what part of the sentence this is." Students will then hold up the frame card "is doing or did" card. By checking all the cards you can informally assess which students do not understand. You can ask students to hold a pencil in their hand and ask, "What are you doing?" The students reply by saying: "I am holding a pencil in my hand." Ask if "holding is something you do? Is it an action? Then it is "is doing or did" part of the sentence. Continue with "The girl" and "a gold coin" Then talk about how every sentence begins and ends. There is another example to do with the class in the packet. 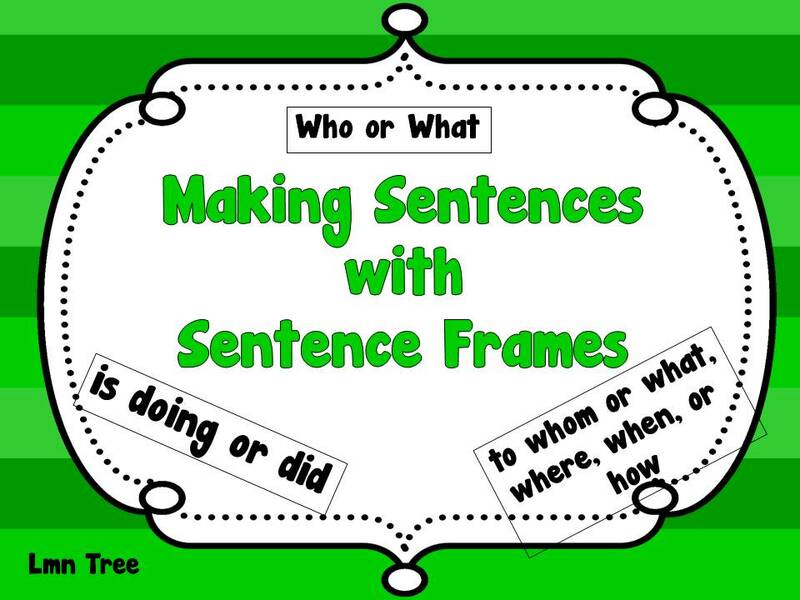 Then students will practice making sentences with frames such as the one below which you will copy and cut for a literacy center activity. Then students will write their completed sentences on a recording sheets. There are 8, 3-frame sentences and 8, 4-frame sentences. Students will then write sentences and illustrate them and also unscramble sentences. Finally they will choose words from a Shamrock and write 4 sentences independently to assess their understanding of writing a complete sentence. You can check out the complete lesson and get 2 free activities when you download the Preview file by clicking on the picture below. 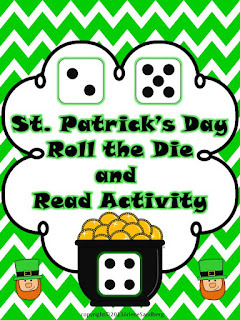 I also have a freebie reading activity that can be used with the writing packet that you can download by clicking on the picture below called : St. Patrick's Day: Roll the Die and Read Activity. Hope you enjoy the free activities. Thanks for all you do to make a difference for your students.